The Rebecca Moy Exhibition opened this past Friday, at Gallery 180, with a wonderful reception catered by the Culinary school of The Illinois Institute of Art-Chicago. The Moy exhibition consists of eight large-scale canvases, elegantly manipulating the spacial relationships of line, form and color. If you're in Chicago's Loop, this is a "must see" exhibition. The show continues through January 17th. 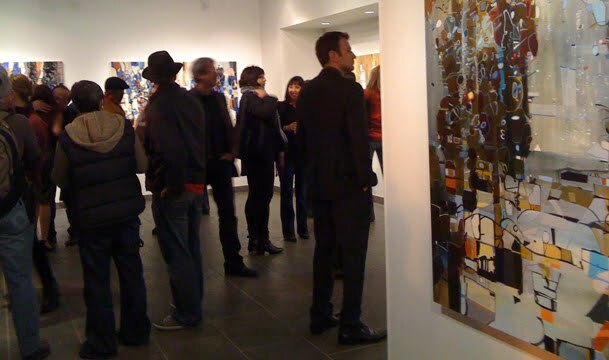 Gallery 180 is free and open to the public. All works will be available for purchase. Gallery 180 is located at 180 N. Wabash—at the corner of Lake and Wabash—in Chicago’s Loop. The gallery is open Monday through Thursday from 8am-8pm; Friday, 8am-5:30pm and Saturday 9am-5pm. Additional information can be found at gallery180.com.